Next week is the Fourth of July and that means that the BBQ season is in full swing. Those fun filled get-togethers with tons of food and friends are a fantastic way to celebrate the great weather and spend time with family and friends, but they can really do damage to your waist-line. Two weekends ago, my husband Nate and I went to a BBQ on Friday night, Saturday night and Sunday night…totally fun, but challenging to eat right. For instance, a typical plate can be well over 1,700 calories, 86 grams of fat (26 of them being saturated), 357 mg of cholesterol and 3,508 mg of sodium. This is what that plate would look like: a hamburger on a bun, a bratwurst on the side, a brownie, potato salad and baked beans. Now separately, those things are not the worst foods in the world, but pile them all high on a plate and devour them in one sitting, and it’s a calorie catastrophe. So what’s a BBQ goer to do? Just follow these simple tricks to keep your heart and waistline healthy throughout the summer. Choose the right meat. If you have a choice, choose grilled chicken, turkey burger or very lean hamburger (93% lean). You will get a great protein pump without the all the calories and fat (especially saturated fat) of the fatty burgers and brats. Don’t fill up on bread. Stay away from rolls and buns. Generally, these are made with refined, white flour anyway, so they can pack in the calories without providing an ounce of nutrition…just say no. Fill up on grilled or fresh veggies. They are low calorie, fiber-filled and nutrient packed. Satisfy your sweet tooth with fruit salad. Again, it’s nutrient packed and much lower in calories than the typical baked goods. Only eat what you really really want to eat. If you LOVE baked beans, have a little bit…not spoonful after spoonful…but get a nice little taste (like ¼ cup) and be satisfied. If it’s brats that you drool over, have a half of one for your “meat” and call it a day. 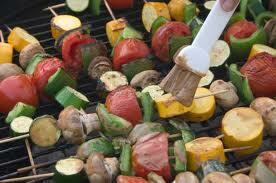 If you’re staying away from carbs all together, a BBQ should be easy for you...meat and veggies…make it your mantra! Bring something to the party that you can nosh on without guilt: think veggie tray. The lighter way to eat at a BBQ. Check out this tasty, healthy and very full plate! For all of that…including a cookie treat…it’s only about 550 calories, 15 grams of fat (5 saturated), 159 mg cholesterol, 509 mg sodium. So go forth and enjoy your next BBQ! So what time of the day should you work out to get the most out of exercise? There isn’t an easy answer. Some people are morning people, some are night owls, but consider the pros and cons of morning, afternoon and evening workouts and then decide when works for you and do it! • You don’t have to worry about “something coming up” and not make it to the gym later…you workout is done! • The snooze button…need I say more? • Getting enough sleep is very important to your health, so if you aren’t able to get to bed early enough to get at least 6 hours of sleep before you get up to work out, you might want to consider another workout time. • Working out before you eat lunch revs up your metabolism and can set you up to succeed with healthy choices during those heavy craving hours between 2 and 4 in the afternoon. Basically, you know yourself and what will work for you body and your schedule. Get into a habit that is right for you so that you will stick with it! Put it on your calendar and get your body moving! 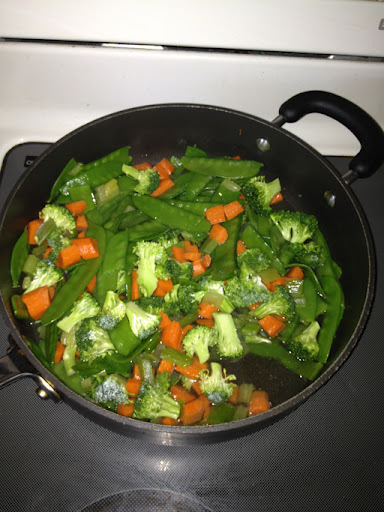 As I type I'm cooking up a super healthy, full of veggie stir-fry. The thing I love about stir-fry is that you can throw in virtually any leftover veggies and it works. Right now, I've piled on the broccoli, snap peas, carrots and celery from veggie tray leftovers and am adding some of my own zucchini and of course water chestnuts for some crunch. I also had some leftover chicken breast that I'm sautéing in cooking spray and a tsp of sesame seed oil for flavor. In planning on stirring it all together with some lower sodium teriyaki sauce and serving over brown rice (pre-made from Trader Joe's). Voila! A way to get in multiple servings of veggies. Enjoy! The summer heat, crazy vacation schedules, office craziness, an on-the-run diet and lack of exercise can really cause a dip in energy levels. 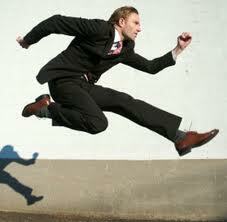 So what’s a person to do to get a bounce back in their step? There’s a lot you can do…check out these natural energy boosters without the caffeine, sugary energy drinks, drugs or naps! Eat for energy. You might get a quick energy boost from that handful of M&Ms or a chocolate chip cookie, but you will crash and burn just as quick. So fuel your body to keep you energized all day long. Eat healthy carbs such as whole wheat crackers or oatmeal, tons of veggies and fruit and remember to always eat protein with every meal or snack. Think almonds, tuna, chicken, turkey, walnuts, natural peanut butter and tofu. Think of your body as an engine and you are providing high grade gasoline when you eat well. Drink for energy. Ditch the “energy drinks,” caffeinated beverages and cocktails and drink water…a lot of water…at least 64 oz a day. One of the major symptoms of dehydration is fatigue, so when you are feeling tired or sleepy, especially in the middle of the day, chug a glass of water. Breathe for energy. Literally, take a breather. Just sit and take 5-10 deep breaths. Stress can cause us to fatigue mentally and emotionally which can manifest as physical exhaustion…so take a seat, inhale deeply, hold for a few seconds, and then exhale slowly and completely. Sleep for energy. Studies show that getting less than 6 hours of sleep leaves us WAY less than 100% not only mentally and physically but energy-wise as well. So get at least 7 hours of sleep and really shoot for 8 for optimal energy. Also, going to bed and waking up at the same time every night and day will help with energy dips. Sweet Dreams! So I'm in a hotel that calls an old treadmill a "fitness facility." So what's a workout addict to do without free weights and barbells? Oh so much! Check it out...do three sets of each exercise for 30 seconds (10 second breaks in between) before moving on to the next exercise. Tack on a couple mile run before or after and you won't miss a beat in your workout routine! It’s summer and that means it’s time for vacations! Whether you’re heading to the beach, mountains, lake, historical sites or grandma’s house, you don’t have to ditch your fitness routine and throw your hard work out the door. Make it a priority to be active on your vacation and come home and pick up your fitness routine where you left off…maybe even fitter than before you left! Here are several easy and some family friendly ways to take your workout on the road to stay healthy and happy! Take a hike and burn 405 calories per hour! Have some time on the green planned? Make sure to carry your clubs and burn 414 calories per hour. Workout in your hotel room using what they provide (chairs, tables, beds, etc.) for pushups, dips, sit ups, lunges. Check out this workout and burn between 500-600 calories per hour! Take your workout to a park or beach and burn 600 calories per hour. Check out this outdoor workout circuit.